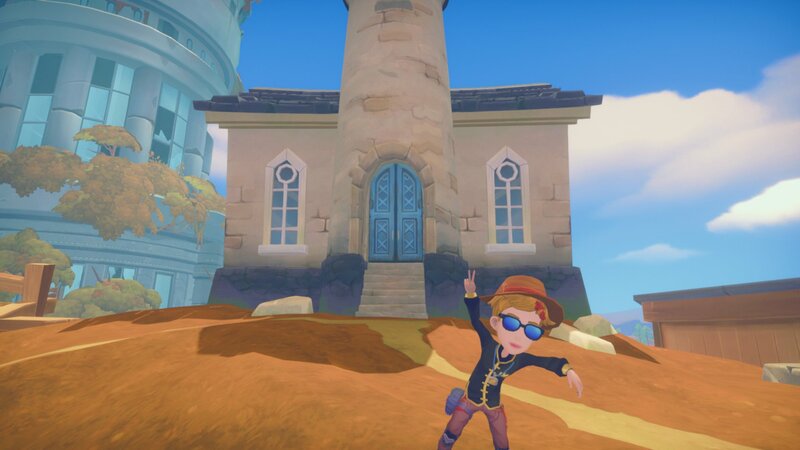 My Time at Portia is the latest entry in the life-sim RPG sub-genre made popular by Harvest Moon, Stardew Valley, et al. From Chinese studio Pathea Games, My Time at Portia offers some differences to the usual formula, going for a 3D third-person view over the usual top-down approach of its contemporaries, and having a greater focus on crafting and building over the more common farming-heavy implementation. With its charming setting and straightforward but pleasantly deep crafting system, it’s very easy to get sucked into and spend many pleasant hours in Portia, but those aiming to get through all of the story missions will likely find it overstaying its welcome. The game starts with the customised player character arriving at the town of Portia at the request of their absent father, who has bequeathed them his old abandoned workshop. After doing some initial fixing and introducing themselves to the inhabitants, players go about crafting items, buildings, or machines for the town. These cover everything from smaller personal items or requests to grander projects at the behest of the major, such as assisting in the construction of a bridge, to more adventurous story-related quests such as finding out what has fouled the town’s water supply or investigating newly-opened sets of ruins. Fortunately trees (and rocks) grow back quickly. In addition to the actual crafting elements, there is both time and resource management. In-game time goes by at a rate of roughly a minute per real-life second, with players automatically waking up at 7am and required to be in bed before 3am — failure to be in bed results in a collapse from tiredness, though staying up that late is not generally helpful anyway. During this time players will need to determine whether they go out mining or logging, fulfill one of the official daily requests from the townspeople, dive into dungeons, spend time talking, etc. During the review playthrough, a good pattern was found of spending the morning on general maintenance work and selecting a request, with the afternoon devoted to one particular primary task, potentially with the specific goal of fulfilling the request if it can’t be done immediately. Certain days will be taken up by town events, such as the autumn festival or martial arts contest, which are optional but always a nice touch in bringing life and a sense of community to Portia. Another big part of the game is upgrading the player’s workshop with facilities such as furnaces, skivers, cutters, etc. to produce items and ingredients from the base resources. The facilities will happily produce items in the player’s absence once provided with the raw ingredients and fuel, and part of the daily routine is replenishing these. It’s always nice to return to the workshop with lots of new materials ready to pick up, and checking up on them is a nice and quick process, but players will need to ensure these are constantly running and likely have multiple of each — especially furnaces — if they want to have enough resources for most of the larger projects and substantial home upgrades. Meanwhile, the larger building projects will be need to be put together manually by bringing the items to the large crafting station. Crafting items and materials is a straightforward process; there are no failure chances or quality ratings, players simply need to have the ingredients and the correct facility. However, the depth comes into just how many resources and potential materials there are and how they are all interconnected. 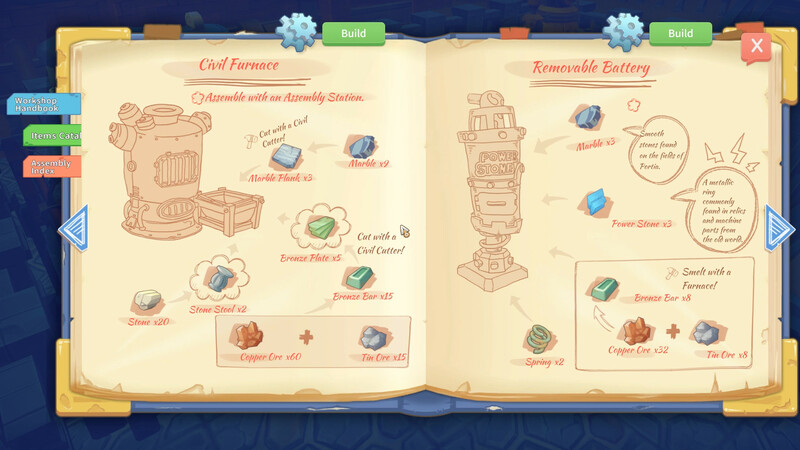 Players will need to combine the raw ingredients into a more advanced ingredient first, for example crafting copper ore into copper bars and then shaping them into copper pipes before they can be used to help create a bus stop. Players can recruit help in finding materials from the townsfolk and some trading buildings, though it must be said that My Time at Portia doesn’t do the best job of explaining how to use them. Some of the more advanced creations will also require technological artifacts left behind from the more-advanced past, an intriguing, if otherwise underused, part of the setting. Plenty of materials are needed for the more advanced creations. My Time at Portia is set in a post-apocalyptic world, though not in the usual sense that the theme is used. The world is well on its way to recovery — at least the part shown — with lush nature and established and functioning governments. It provides an interesting setting for the world and a few conflicts between those looking towards technological progress and those trying to ensure that the mistakes that led to the collapse aren’t repeated, though the main theme is generally left in the background outside of certain events and a couple of specific characters. Portia and its inhabitants make for an immensely charming setting that’s thoroughly enjoyable to be in; given the current nature of the world, it’s nice to see the conflicts resolved sensibly by those involved and people aiming to work together for the betterment of all. Portia is a relaxing place, which results in a plot that doesn’t provide much excitement. It also takes far too long to be able get through the complete set of story missions. The game artificially extends the time taken to reach the credits to over eighty hours as it often requires that players wait several game days before something happens that they can address. The game would have been better served supplying main missions much quicker and moving more of the plentiful side content to the post-game. This includes a lot of the usual things associated with the sub-genre, including getting married with no gender restrictions. There is an option to have children, but this requires a fully upgraded house, something not realistically attainable until after the main story is finished. 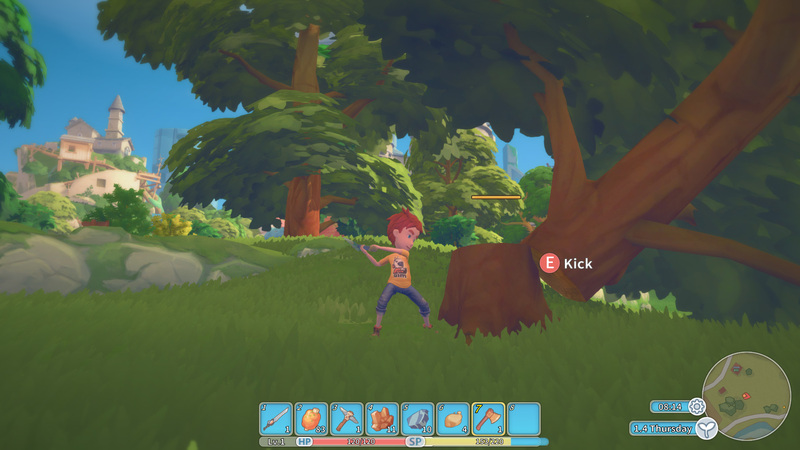 My Time at Portia does feature combat, but it is easily the weakest portion of the game. The combat system is very straightforward, with players able to simply attack or dodge. Combat is clearly an afterthought as little effort has been put into any substantial form of balancing. Some enemies can be frustrating, especially in groups, but on the whole combat is simply a case of whacking enemies and rolling at the appropriate time. Bosses can vary between trivial and very powerful, but in story fights with the latter group, players can literally stand off to the side and let the NPCs that accompany them in these quests do all the work. Thankfully, combat isn’t a massive portion of the game, but players will need to engage in it to attain certain important resources. It’s thus a very wise decision from the developers to let experience points be gained from all actions — including crafting, resource gathering, etc. — not just by defeating enemies. Of course there’s a camera mode. The visual style and designs are nice and part of what makes Portia so charming. All the named characters are distinct and easily recognisable, while the environments are pleasing to look at. It’s also appreciable to see all of the projects the player helps with slowly upgrading the town, as bus stops are put up, the tree farm is fully built, irrigation put into on the neighbouring farm, and so forth. The music further adds to the charm with enjoyable themes that work well with the aesthetics. The voice acting is fine, though the number of lines is fairly limited and there’s nothing in the writing that requires or brings forth any emotion, while the sound effects are repetitive and not all that interesting. Both come off as merely being there without adding anything to the game. It’s a lovely place to spend time in, but My Time at Portia overestimates just how long players will want to spend there. Crafting, collecting resources, and interacting with the townsfolk is all a lot of fun and a very appealing prospect but by the time I was around two-thirds of the way through main missions I was more than ready to be done. The artificial extension of the main story as players have to wait for NPCs to decide to do something is nothing but an annoyance, while the combat is generally unappealing. In the end, it’s a game that has some incredibly strong points that was very enjoyable for the majority of the time spent with it, but the significant weaknesses mean it’s not a universal recommendation.